To find out what kind of people the Poles are, you need to read Sienkiewicz’s Trilogy, says film historian Vladimir Gromov. For this same reason, it is worth watching all three of Jerzy Hoffman’s films based on this work, as well as the new condensed and digitised version of the film The Deluge. Vladimir Gromov discusses the history of the filming of one of the most famous works of Polish literature. Henryk Sienkiewicz’s Trilogy was written in difficult time for Poland. When the Poles, one of the brightest and most influential peoples of Europe, were deprived of their own state, Polish language and culture were outlawed. Ironically, many great works of Polish literature were created during this time, among them the novels of Sienkiewicz. His Trilogy became not only a fascinating narrative about the times of greatness of the Polish-Lithuanian Commonwealth, but also one of the best conversations on Polish character and outlook of the world. Witty heroes, brilliant descriptions, expressive language, an exciting plot… One can safely say that to know the Poles, you must read the Trilogy. Adapting the Trilogy to the big screen was a matter of honour for Polish filmmakers, but this was no easy task. The novels that comprise the Trilogy are quite large and their plotlines are multidimensional and difficult to construct. The books are literally crowded with meticulous descriptions of large-scale battles and discussions about all sorts of conflicts that tore up the Commonwealth. Attempting to undertake this challenge demanded the efforts of a big production crew, a substantial budget, professional workmanship and excellent actors. And yet in the mid-1960s, they managed to accomplish it. The first novel of the Trilogy, With Fire and Sword, describes the events in Ukraine in the period of the Bohdan Chmielnicki Uprising against Polish rule. Sienkiewicz considered Chmielnicki a rebel and a cunning rogue, who unleashed a vile war between the Polish and Ukrainian peoples. Of course, this point of view was biased and subjective. Many pages of the novel seem candidly anti-Ukrainian – though the book itself was written with an enormous love for Ukraine, its culture and past. Anyways, when work on the film adaption of the Trilogy began, Ukraine was an important part of the Soviet Union and the General Secretary was one of its natives. A film based on the novel With Fire and Sword could cause a big international scandal. Because of this, the young and ambitious director Jerzy Hoffman, famous at the time for his documentary films and comedy Gangsters and Philanthropists, decided to simplify the task for himself and begin from the end. The last novel in the trilogy, Fire in the Steppe, tell the story of the clash between the Polish-Lithuanian Commonwealth and the Ottoman Empire, which at that time could hardly been seen as an act of provocation. This wouldn’t cause a problem with the plot either, as the three parts of Sienkiewicz’s epic are separate from each other. Reading (or watching) them in chronological order isn’t necessary. Colonel Wołodyjowski (Hoffman chose to name the movie after its main character) turned out to be a dazzling success. Jerzy Hoffman skillfully handled this large-scale production and effectively transferred the charm of Sienkiewicz’s characters to the screen. Tadeusz Łomnicki, one of the best Polish actors of the 20th century, played the beloved title character. Wołodyjowski is a career officer, having spent his whole life serving in the army, a skilled swordsman and excellent commander. Despite this, he is not very sure of himself and not a particularly lucky person. Łomnicki’s performance of Wołodyjowski was noble, serious and brought across Wołodyjowski’s lack of hesitation to sacrifice himself in battle. The success of Hoffman’s adaptation was so considerable that the production of next installment began soon afterwards. The Deluge, however, is quite different in character. Colonel Wołodyjowski was not a very long book: by the time he reached the last installment, Sienkiewicz was already sick of working on the epic. The Deluge was a different matter. It has three parts, a multitude of plot lines and an incredible number of battles. Sienkiewicz wanted to describe every detail of the so-called Swedish Deluge, one of the most surprising events of Polish history. In 1655, the Swedes occupied the main part of the Polish-Lithuanian Commonwealth, taking the capital and main cities. The gentry and army were not ready to defend the state, some of the magnates switched to the side of the occupiers and King Jan Kazimierz ended up fleeing the country. It took time to gather a new army and to rid the Commonwealth of invaders. The eventual victory over the Swedes strengthened the Polish state. During the following decades, Poland was able to repel the Turkish invasion into Europe time and again and, possibly, reverse the course of European history. The main character of The Deluge, Andrzej Kmicic is a young, ambitious, talented officer, acquainted with the nobility – yet, at the same time, he is very cruel and depraved. War draws out the worst features of his character: in the eyes of many he is not only an autocratic bandit, but a traitor and collaborator. His fiancée Oleńka Billewiczówna cannot excuse his cruelty, therefore Kmicic must perform many good deeds to make up for his crimes and prove himself worthy in the eyes of his beloved. How will Jerzy Hoffman handle such a complicated novel? And what actor can play such a character as Kmicic? This question was on the lips of many Poles in the beginning of the 1970s. Hoffman chose Daniel Olbrychski, and at first, this caused widespread discontent. The actor, though fairly popular at the time , still was not a recognised star. In addition, he was young and had a very distinctive look and figure. Finally, he had already played one of the main roles (Azja Tuhajbejowicz) in Colonel Wołodyjowski, and it would be weird to see him in the new installment as a different character. Critics became increasingly worried. None of this bothered Hoffman, but it troubled Olbrychski, who wanted to refuse his generous offer. The director’s unimaginable force was required for the young actor to take part in the film. The filming of The Deluge turned out to be quite an undertaking: it required a significant budget and the state needed to step in to help. It was a significant decision by the communist regime in Poland, given the unfavorable political situation and gradually choking planned economy. They turned to their ‘big brother’ for assistance. The production of The Deluge utilised the resources of Mosfilm’s filming facilities, a special cavalry regiment of the Soviet army and a multitude of volunteer extras. The communist authorities tried to take control of the film: they did not like the religious pathos of Sienkiewicz, who in The Deluge described the defense of Jasna Góra monastery in Częstochowa as the turning point of the war with the Swedes: the battle, during which the defenders of the monastery prevented the Swedes from capturing the most important Polish icon, the Madonna from Częstochowa (Black Madonna), turned the tide of the Swedish invasion. The desperate Poles, seeing how the monastery fought back, became united, rose up and drove the Swedes out of their land. This moment disturbed the Soviet administration, who set the condition that the defense of the monastery could not be the climax of the film. It took more than 500 days to film The Deluge. The film crew worked in Belarus and Ukraine; many scenes, including the defense of the Jasna Góra monastery, were shot on location in Poland. The film was shot with a ‘Panavision’ camera for a widescreen projection –the best quality film available at the time. The cinematographer was Jerzy Wójcik, who produced such masterpieces as Ashes and Diamonds (directed by Andrzej Wajda), Eroica (directed by Andrzej Munk) and Mother Joan of Angels (directed by Jerzy Kawalerowicz). The cast was no less impressive. Tadeusz Łomnicki reprised the role of Wołodyjowski, who is also one of the main characters in The Deluge. Władysław Hańcza and Leszek Teleszyński wonderfully portrayed the ambitious Radziwiłł brothers, who played a very complicated role in the Swedish invasion. And of course, everyone remembers Kazimierz Wichniarz in the role of Jan Onufry Zagłoba, the most colorful character in Sienkiewicz’s Trilogy. The 5-hour long Deluge debuted in Polish movie theaters in 1974. It was a colossal success. The picture was received with great affection in Poland and became an instant classic. Hoffman’s films, to some extent, played the same role in Poland under the communist regime that Sienkiewicz’s novels played nearly a hundred years earlier. More than anything, it was a work about the Polish character, about how the people managed to survive, despite the terrible historical challenges and the brutality of their neighbors. A special interest was taken in the interpretation of the original work. Sienkiewicz was a fiery and intolerant writer. He deeply despised anyone who for whatever reason refused to serve the Commonwealth and considered steadfast hatred for the enemy to be a just thing. Jerzy Hoffman could not afford to be this way himself, given the historical circumstances. His own fate did not allow him to be unambiguous: Hoffman came from a family of Polish Jews, he spent his childhood in exile in Siberia. He saw all of the cruelty of the Soviet state, however later he received his directorial education in this country and his teacher was Mikheil Chiaureli, the master director, who was also the creator of the most notorious propaganda films about Stalin. In Hoffman’s interpretation, the war with the Swedes was a difficult journey of self-exploration for Andrzej Kmicic. Hoffman saw Kmicic as an immature and cocky person. Namely because of such people, who put their own rights and desires above the established laws, the Commonwealth disintegrated. In the film, Kmicic’s bride Oleńka represents Poland: in his endeavors to earn her love, Kmicic secures their own country, peace and the opportunity, despite all his terrible actions and injuries, to move on. At the end of the film, when King Jan Kazimierz, preaching from the pulpit of a church, grants Kmicic forgiveness and recognises his service to the country, the relationship of Kmicic and Oleńka evolves on a new level. In the end, The Deluge is a story about how your country can only be earned: you regain it by breaking not only your enemies, but your own self. The Deluge made Jerzy Hoffman a classic for life. His popularity grew and he later directed such films as To the Last Drop of Blood and The Quack; however he never made another movie of comparable mastery to the two pictures on the novels of Sienkiewicz. More than 20 years passed after The Deluge came out. The communist regime in Poland fell, the Soviet Union came apart. Polish film went through a period of oblivion and commercialisation. The old system of film distribution was destroyed. It was during this time, that Hoffman decided to complete his life’s work and adapt the final, that is the first in chronological order, novel of The Trilogy. The bank, which considered financing the production of this film, even took a poll throughout Poland: would you go to the movie theater to see Jerzy Hoffman’s film With Fire and Sword? The majority of respondents replied positively. With Fire and Sword, which appeared on screens in 1999, was filmed in a completely different manner than the first two films: Hoffman generously used new innovations in filmmaking, but he was forced to economise for the decorations and extras. Even so, the third film was successful with audiences. The film was repeatedly shown not only in Poland, but in Ukraine and in Russia as well. With Fire and Sword still caused controversy, even though Hoffman, as with the previous films, softened many accents and told the story so that it certainly could not be called anti-Ukrainian. Later on, many people tried to ‘be Hoffman,’ but only managed to create rather mediocre films, such as A Prayer for Hetman Mazepa and Bohdan Zenobi Chmielnicki (Bohdan-Zinoviy Khmelnitskiy) in Ukraine and 1612 and Taras Bulba in Russia. It seemed that Jerzy Hoffman would never again return to the Trilogy, but that would not be the case. A few years later, it was decided to digitise the negative of The Deluge and produce a large-scale restoration of the film. 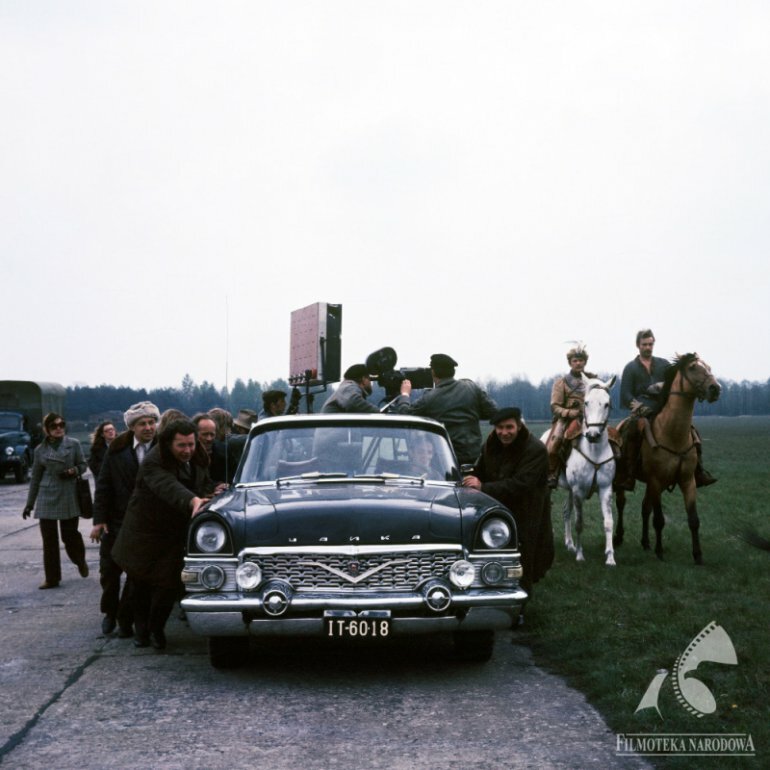 The Polish Film Institute wanted to restore the colours and sounds of the picture, as well as clean up all defects in the spools of film. The company, which undertook this job together with the cinematographer of The Deluge Jerzy Wójcik, achieved phenomenal results. Skilled specialists and computer technology drew incredible colours out of the faded film, making the movie more interesting and vivid to watch than many modern blockbusters. Jerzy Hoffman was so impressed by the results, that he made an unexpected decision. He wanted a modern audience to be able to see The Deluge on the big screen and to refresh the film to make it more dynamic. To accomplish this, Hoffman summoned the young, but already experienced film editor Marcin Bastkowski, with whom he made his last film. This task seemed a bit radical. He decided to remove a large amount of material from the film with the purpose of creating a dynamic and modern narrative. Bastkowski took more than 2 hours off of the film’s duration. Many scenes were changed and a considerable part of the storyline disappeared. Nonetheless, the new version retains all of the charm of the original, as well as its ideas and pathos. The picture was called Potop Redivivus which means The Deluge: The Return. Last year marked the 40th anniversary of the premier of The Deluge. The new version of the movie, which was met with enthusiasm by both audiences and critics, came to theaters in commemoration of this event. We all have another opportunity to revisit this wonderful movie, re-evaluate it and think about why it speaks to us.